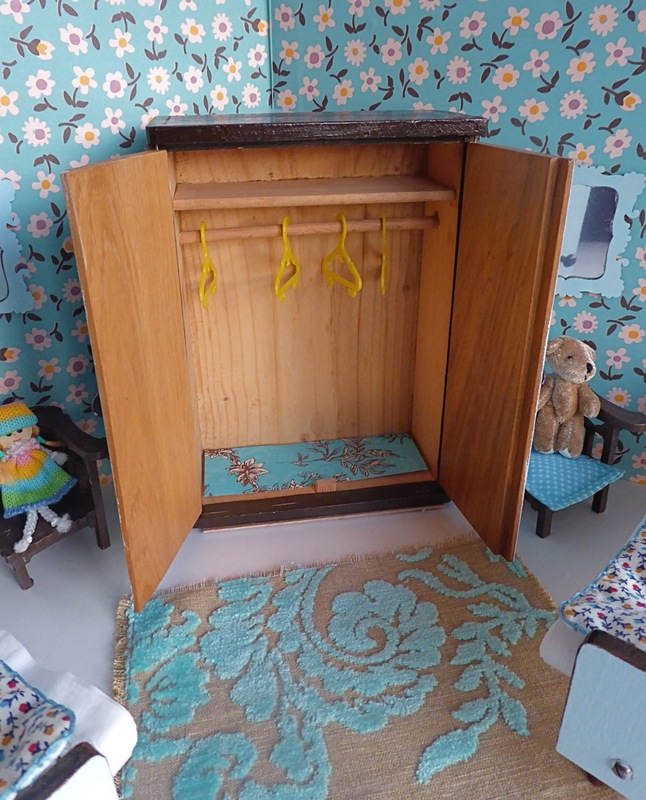 WARDROBE: Lovely, wooden mid-century wardrobe; inside there’s a shelf and a clothes rail with four hangers. The wardrobe came to us with the twin beds below. BEDS: Stylishly simple twin beds which have been given our usual high-quality, handmade and hand-washable bedding. The bedding comprises a handmade, tufted mattress, vintage mattress cover, soft cotton blanket, reversible coverlet handmade and two handmade pillows. 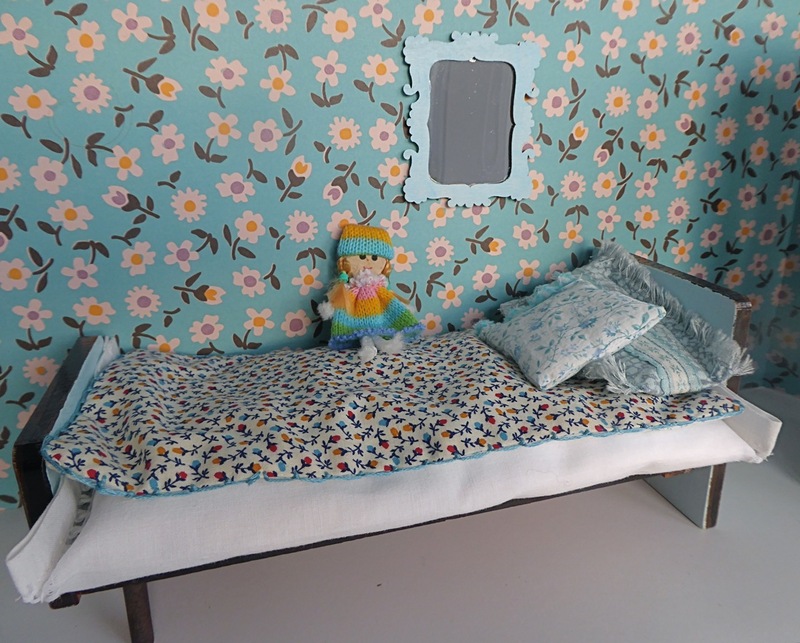 Please see the close-up photo of the bed to see the details of the bedclothes. 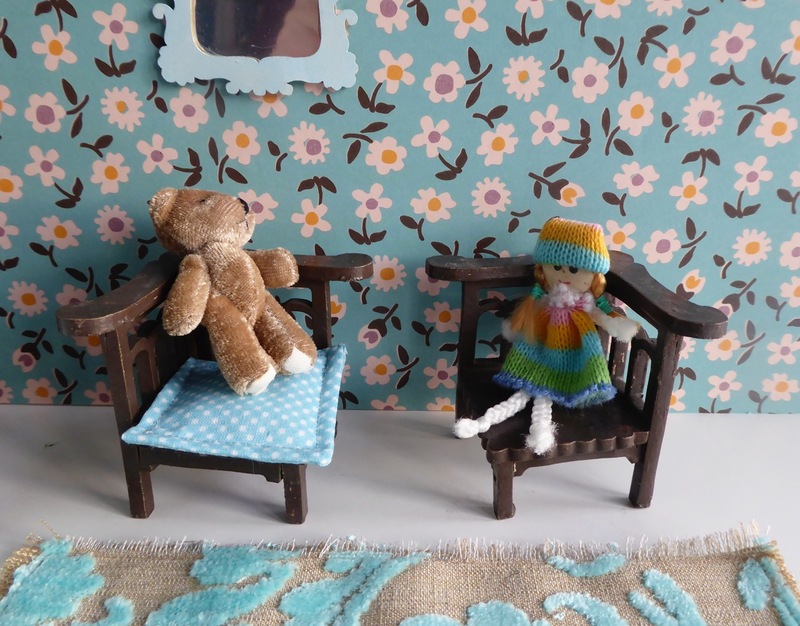 CHAIRS: An antique pair from the early decades of last century and perfect for holding dolly’s teddy. RUG: A vintage linen and cotton chenille fabric scrap makes a perfect rug. MIRRORS: Modern, laser-cut mirrors painted to match the furniture. WALLS: Covered in flowery, vintage patterned paper, which has been mounted on two pieces of 5mm thick A3 foam board. . Each piece of foam board measures 42x29.5cm or 11 5/8 x16 3/8in. DOLLS: Chosen from our selection of vintage dolls – please see the relevant section of our website for a greater choice. The dolls shown here are Kenner dolls, both with red hair, but with slightly different haircuts. - ideal twin sisters! These doll are also available with blonde or brunette hair, and can be found in the DOLLS section of our website, under “Other Dolls”. Clothing for these dolls is available upon request.